Mt. Sneffels shadow, Teakettle on the right, Cirque Mountain in the center. With warm September temperatures and a gorgeous clear blue sky, yesterday afternoon I hiked up Mt. 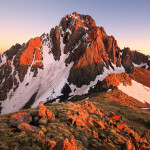 Sneffels to watch the sunset from the 14,156 ft. summit. Though I could have driven my truck to the upper trailhead, I decided to start from the lower trailhead because there was no hurry and I needed the exercise anyways. I hiked up to Blue Lakes Pass then took the southwestern ridge route to the summit, a fun scrambly route that I’d never done before. I relaxed for a couple hours up on top, had fun taking photos of the sunset and the post-sunset glow, then made my way down the standard route via headlamp and a quarter-moon. This was the fourth time I’ve summited Sneffels, but it was the first time I’ve seen the sunset up there, and the first time I’ve hiked it without crampons and a springtime snowpack. 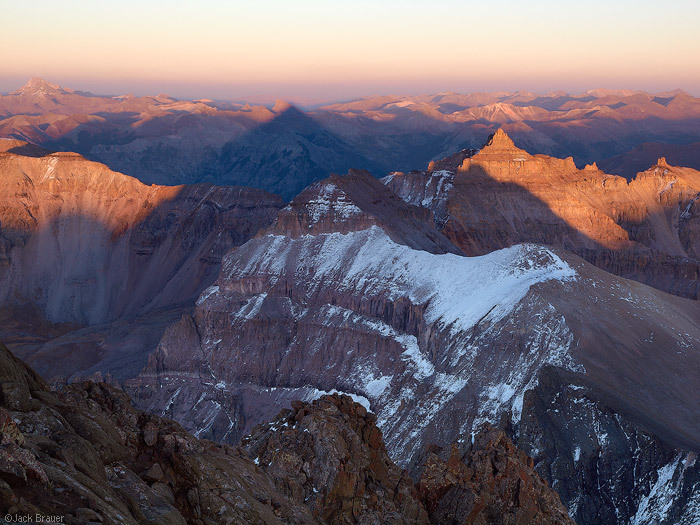 Here’s a link to some photos from a previous hike I did up Sneffels for the sunrise, via moonlight. 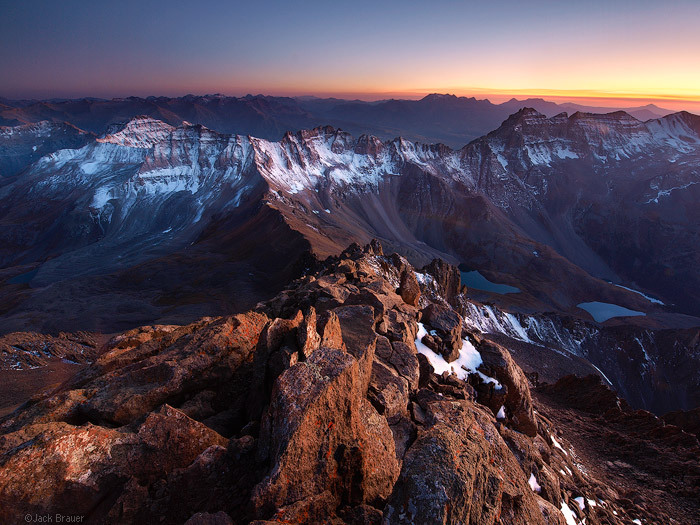 Posted in Colorado and tagged 14ers, Colorado, San Juans, Sneffels on September 27, 2009 November 10, 2013 by Jack Brauer. ← Previous: "Solar Ranch Sunset"
These are gorgeous. I love the light in the first one…the clarity of both images is stunning. What is your blending method if you don’t mind me asking? Must’ve been a magical night up there – both are so powerful, but the pyramid shadow is a mind-blower! SICK! love the 2nd one. I remember thinking last weekend would have been perfect to spend the night on top of a peak. well done. You are amazing! Climbing Sneffles the easy way in daylight is enough of a challenge, but going from the Blue Lakes side with camera equipment and returning in the dark is just not human! I love the shots and that shadow is exquisite. Very nice pictures! Would you be willing to release the rights to the second picture on this page for us to use on a CHristian publication?